Time for another Cross Impressions article from the coveted Leonard 2012 Video Game Olympics! 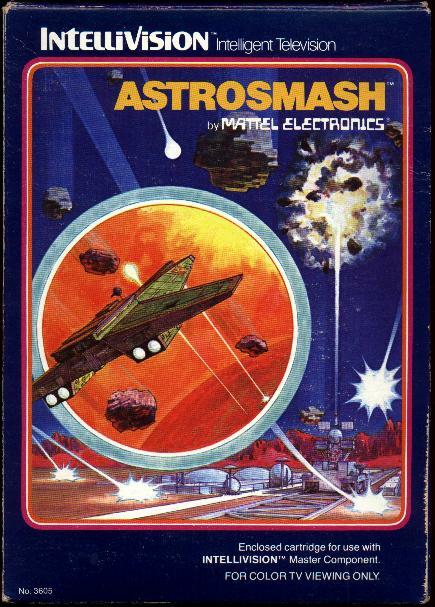 Up for discussion is Astrosmash for the Intellivision. That little, old system that couldn't. Earth is being pelted by falling rocks, bombs, guided missiles, and UFOs and it’s up to players to protect it as best they can in Astrosmash. 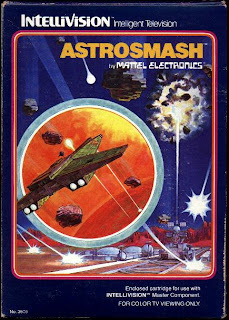 Released for the Mattel Intellivision in 1981, Astrosmash plays like a cross between Space Invaders and Asteroids; fittingly the game is all about getting a high score. John Sohl from Mattel Electronics developed Astrosmash. The only other game to his name on the platform was B-17 Bomber. John: An interesting arcade style game that was relatively fast-moving game, although it seemed quite easy up to the point where we finished. Because we kept earning lives rather than losing them, we decided to award the game to whoever got the most points using one life. The falling rocks breaking apart into smaller pieces and the hyperspace features were reminiscent of Asteroids and the game in general had a lot in common with Space Invaders. It turned out to be one of the better games we played on the INTV and it was one of the best looking. Jeff: It reminded me more of Missile Command at first because of the laser gun’s position but I’ll concede that it had more of a Space Invaders vibe. I think the INTV’s disc pad is the biggest downfall to this game. Very loose and not responsive at all. Had to learn the inadequacies of the controller before the game “ramped up” it's difficulty. The game was functional and decent overall, but I HATE the INTV’s controller!